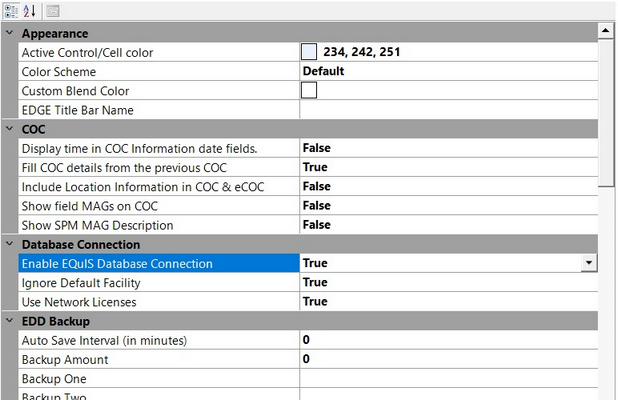 The Database Connection feature allows users to connect directly to an EQuIS database to retrieve reference values or to download a Reference Values file (RVF). 1.In the application menu, found in the top-left of the screen, click Options. 2.Find the Database Connection section. 3.Change Enable EQuIS Database Connection to "True". 4.Change Use Network Licenses to "True". 5.Click OK. The Database ribbon will appear at the top of EDGE. 1.In the Database ribbon, click on Connect to EQuIS Database. 2.Log in to the desired database by connecting to a facility. 3.EDGE will restart, opening the most recently-used format and pulling reference values from the database. 4.After connecting to the database, click the Download RVF button in the Database ribbon. 5.In the screen that appears, give the RVF a name and note the file path listed; this is where the RVF will be downloaded. 6.When prompted, choose whether or not to switch to the newly downloaded RVF. Upon starting EDGE each time, users will be prompted to connect to a facility.